The Rack Blinky 5 uses the same low-power 5mm LEDs as the Blinky 7, but all in a straight array facing directly back. This kit comes with a rack mount included, making it easy to attach to the back of your bike. 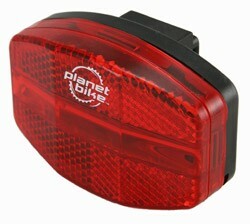 It uses the same mounting clip as other PB lights, but has a slightly wider, shorter profile. This light was surprisingly bright for a blinky, although it’s still dim next to either of the Super Flashers. One aspect of the Blinky 5 I am impressed with is the wide spread of light. Even from off-angles, it’s easy to see. The biggest downside to this light is its on/off button. Whereas most PB lights are too difficult to turn on, this one is far too easy. It is controlled by a large soft push button on the back, which is way too easy to bump in your pack. I always take my lights off to prevent them from being stolen, and several times went to look for something in my pack, and found this light flashing away. A simple time-delay like many other manufacturers’ lights would help this problem.